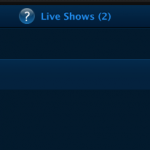 I am a frequent podcast live-stream listener. 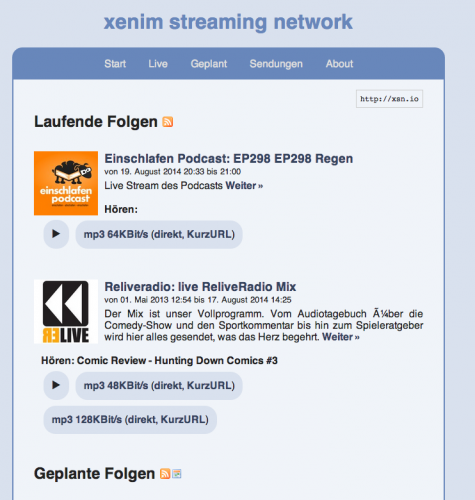 And being that I am enjoying the awesome service called xenim streaming network. 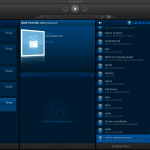 Any Podcast producer can join the xsn and with that can live-stream his own Podcast while recording. 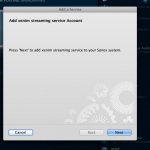 It’s CDN is based on voluntarily provided resources and pretty rock-solid as far as my experience with it goes. 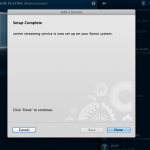 Since I am a frequent user of this – and I’ve got that gorgeous SONOS hardware scattered around my house – I thought I need to have that service integrated into my SONOS set. 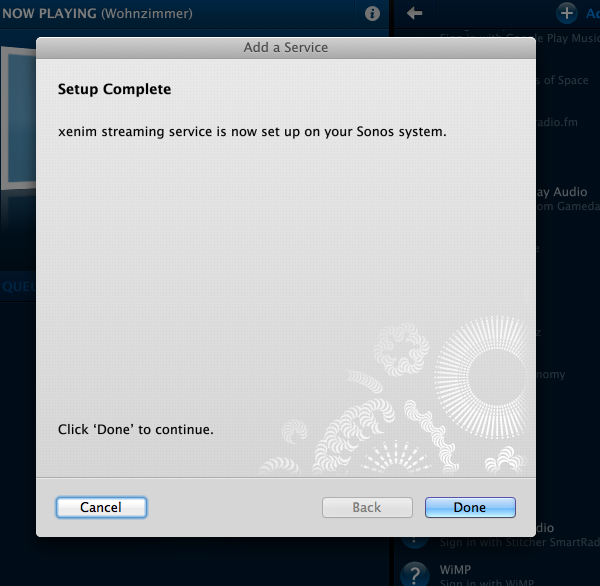 The SONOS system knows the concept of “Music Services”. There are quite a lot of them but xsn is missing. 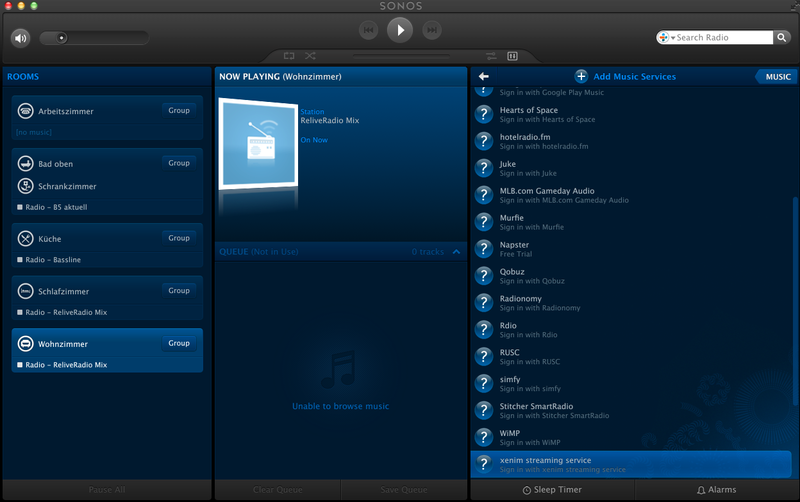 But SONOS is awesome and they got an API! Unfortunately the API documentation is hidden behind a NDA wall so that would be a no-go. What’s not hidden is what the SONOS controllers have to discuss with all the existing services. Most of the time these do not use HTTPS so we’re free to listen to the chatters. 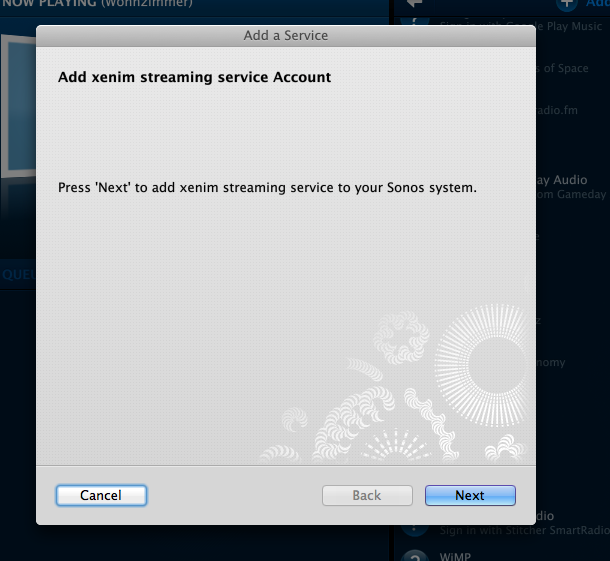 I did just that and was able, for the sake of interoperability, to reverse engineer the SONOS SMAPI as far as it is necessary to make my little xsn Music Service work. 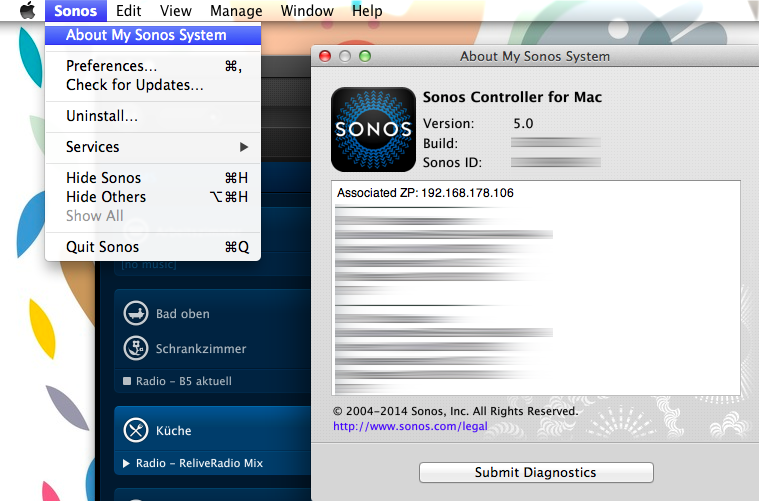 Step 1: Start your SONOS Controller Application and find out the IP address of your SONOS. 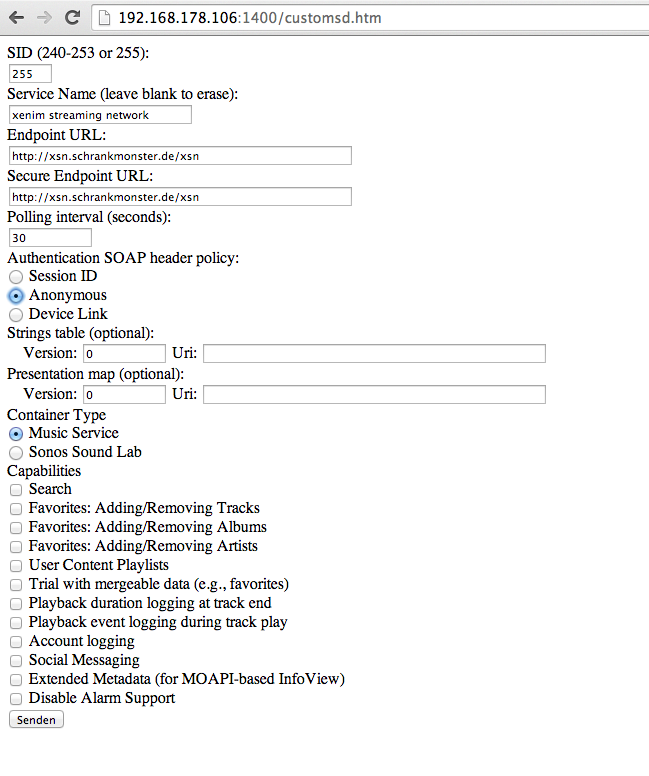 Click on “About My Sonos System” and check the IP address written next to the “Associated ZP”. Step 2: Add the xsn Music Service. Set the Polling interval to 30 seconds. 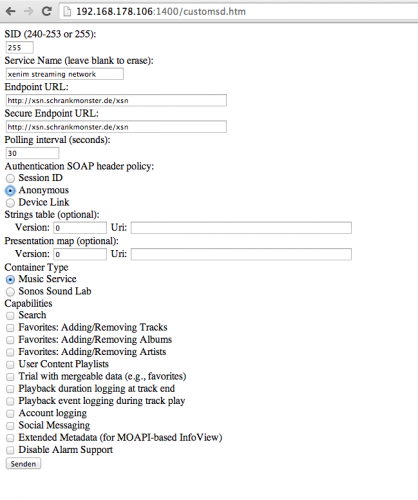 Click on the Anonymous Authentication SOAP header policy and you’re good to go. Click on “send” to finish. 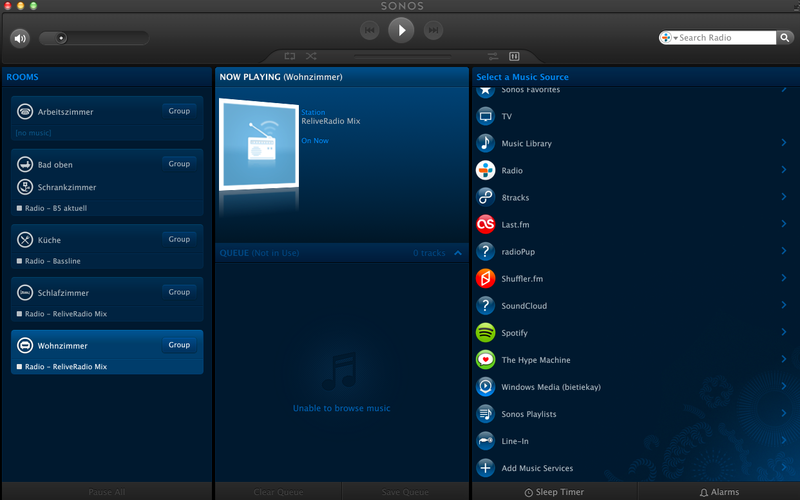 Step 3: Add the new Music Service to your SONOS Controller. 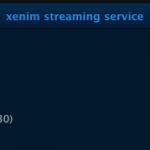 Click on “Add Music Services” and click through until you see “xenim streaming network”. Add the service and you’re set! p.s. 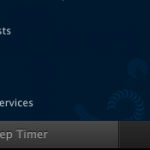 : It’s normal that the service icon is a question mark. Step 4: Enjoy Live Podcasts! So it happened to one of the VU+ Duos in the house. After a clean shutdown it did not boot up as expected but instead just showed the red light. It still blinked on remote keypresses and the harddisk spun up. Nothing else happened with it. 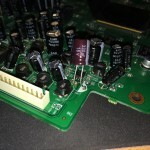 Reading the forums about that pointed to a capacitor on the board that quite regularly seems to fail. 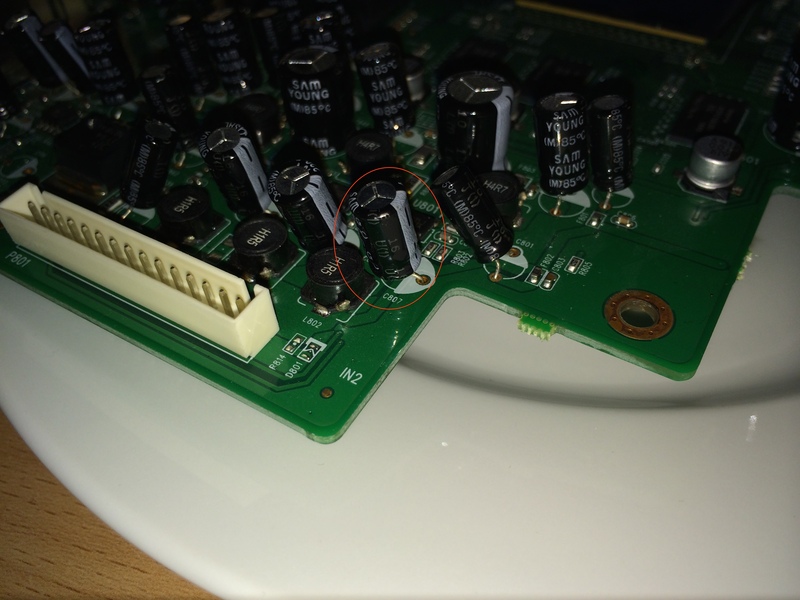 C807 is it’s name and it’s located near the Harddisk and the power-supply part of the VU+ Duo. 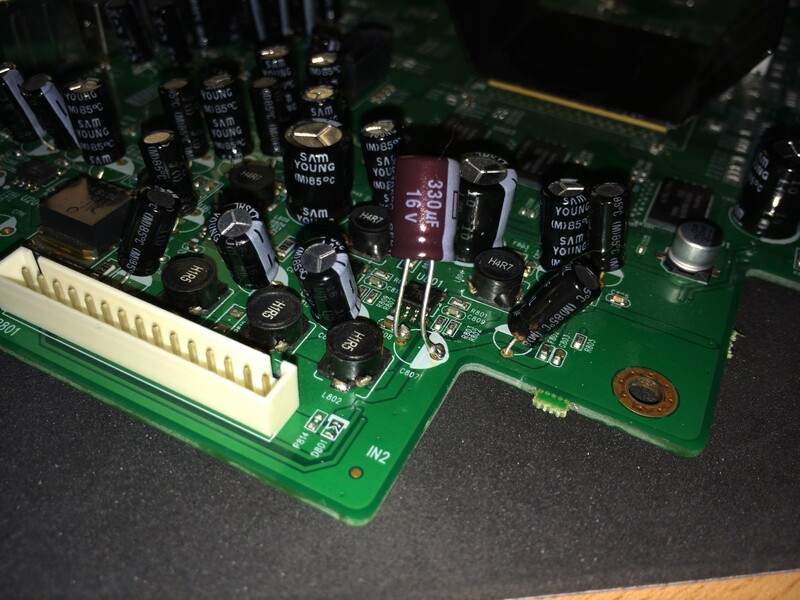 When I looked at the capacitor it did not seem to be faulty or anything. So without the right tools to measure I’ve decided to just give it a shot and replace the original 16V 220uF 85 degrees celsius capacitor with a 105 degrees celsius 16V 330uF one. 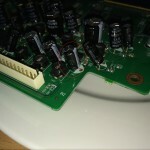 Replacing it on the left-over pins of the old capacitor was a matter of seconds. 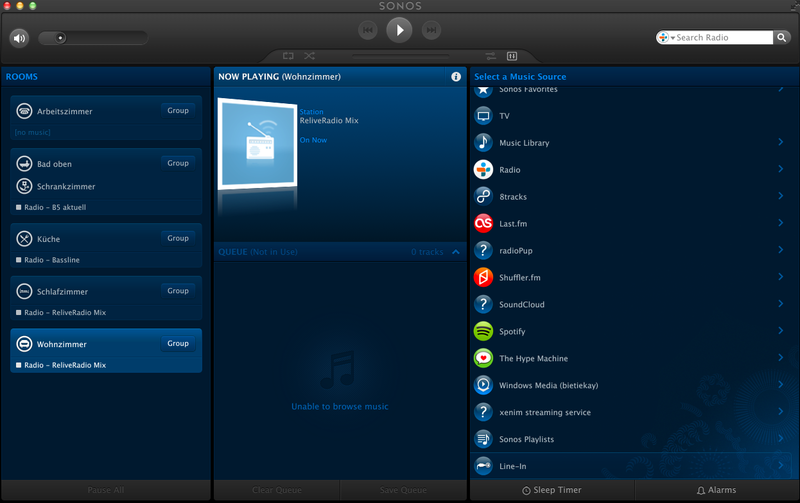 After putting the board back in, the VU+ Duo powered up and booted as new. Brilliant!